Hy proeft te gaen op 't ys, hy heeft twee schaetsen aen. Daer mede dat hy meynt op 't water vast te staen. More on the origins of the idea of the 'uncivilized Dutch' in: Wesseling, Are the Dutch Uncivilized? On the use of typical Dutch elements in the picturae in Cats's Sinne- en minnebeelden: Luijten, Gezien of gelezen? 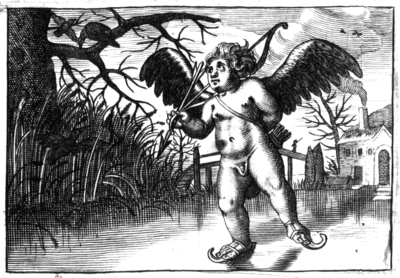 Heinsius in this emblem claims that Cupid, during his stay in Holland, learned more than just the Dutch language. In passing, the god of love also mastered the skill of ice-skating. The Netherlanders - inventors of the "skating game" - taught him how to skate on their frozen canals. In the pictura we see a Dutch winter landscape and the typical wooden skates of the Low Countries. In gaining mastery over the slippery ice, this emblem suggests, Cupid also learned the fine points of the art of love. The situation in love is no different from that on the ice. Like skating, the game of love seems deceptively simple, but can only be learned by trial and error - by falling, getting up and trying again. Now that Cupid has learned from the Dutch experts how to stay on his feet on the ice, he can be considered truly accomplished in the art of love. Heinsius may have employed this positive image of the energetic, skilled Dutchman to counter the idea current elsewhere in Europe that in the cold, wet climate of the Netherlands only people of a crude, unrefined sort could thrive. The point here would then be that only in the Netherlands did Cupid truly learn the fine art of loving. The example Heinsius had set in 1601 with Quaeris sit amor?, and in 1613 with Ambacht van Cupido was followed on a large scale, both at home and abroad. Love emblematics came to full flourish within just a few years. This specific emblem was imitated by John Hall, in his Emblems with Elegant Figures (1658), and was then stripped of typical Dutch characteristics and changed into a religious message to the reader. A change which was perhaps preluded by the motto of Heinsius' emblem that possibly contains an allusion to Psalm 71 of the Vulgate, which declares that "the rich" find themselves in "slippery places" and in imminent danger of destruction.